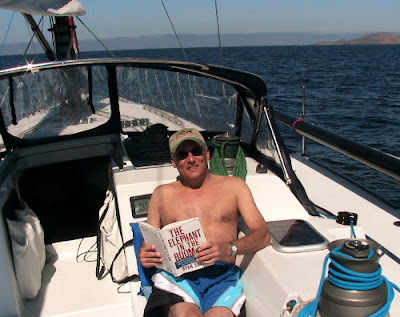 On board the Morpheus , suffering through the infamous "Baja Bash"
UPDATE March 18, 2007: This post was sent via SailMail from a boat somewhere between Cabo San Lucas and San Diego. Subsequently updated to correct formatting and typos, insert links, pictures, and tags. As mentioned in previous posts, I am part of the crew delivering the sailboat Morpheus back to San Diego after the Newport Beach to Cabo San Lucas Race. It has been a fun trip. Regardless whether you can afford or have the inclination to own a boat like Morpheus, if you have a sense of adventure I recommend finding a friend who does. At times frightening, relaxing, exciting, exhilarating, exhausting, life threatening, and amusing, open ocean sailing is an experience not to be missed. It also affords large stretches of time where nothing much is happening, which has given me a chance to catch up on my reading. I finally read Ryan Sager's "The Elephant in the Room", which has been near the top of my reading list since it was published last summer. A great read, it fills in the historical gaps on how the Republican Party has arrived at it's current sorry state, losing both houses of Congress in the mid-terms, with no realistic likelihood of regaining either house in '08, and a real possibility of also losing the White House. This scenario is particularly troubling, since it raises the spectre of a return to one party government in Washington DC, this time under the control of the Democratic Party. 'The Republican Party lacks "intellectual depth"? The president can't "win the argument"? The president lacks "drive" and "understanding," which limits his effectiveness? It all comes dangerously close to an assertion that Bush & Company aren't up to the job intelligencewise, or at least they are too intellectually lazy to govern. And it leads to a surprising rationale for a for a Gingrich candidacy. "We're looking for a next cycle of intellectual politics." Gingrich said "In the tradition of Lincoln, Teddy Roosevelt, and Ronald Reagan." ... Gingrich doesn't mention himself as the standard bearer for the conservative intellectual revival, but if there is one thing the former Speaker has always fancied himself, not without some justification, it's as an idea man and a visionary.' - Ryan Sager, The Elephant in the Room. Sager's highlight of this Gingrich observation is spot-on. It is not difficult to discern a pattern in American politics, where the electorate becomes exhausted with two term administrations and seeks to elect the perceived opposite in the follow-up election. Jimmy Carter's home spun morality made him the Anti-Nixon(Ford). Bill Clinton' empathy and common touch made him the Anti-Bush(41), Bush(43)'s evangelical born-again righteousness made him the anti-Clinton. The next President will be the Anti-Bush(43), and regardless of party, that makes him/her "articulate", an "idea man", and a "visionary" possesed of a luminous intellect the electorate will demand, as it seeks the perceptual polar opposite of the current president. On the Republican side, Gingrich indeed fits that description, but he is not the only one. The current Republican front-runner Rudy Giuliani, also projects competence and intelligence (but as Sager recently pointed out, carries baggage that may yet drag down his candidacy). Chuck Hagel also fits Newt's description of an intellectual President to a "T". Hagel has the additional advantage that his public statements on the war in Iraq put him on the right side of that war before the war, whereas both Gingrich and Giuliani have been completely and disastrously wrong on the Iraq war since it's beginning four years ago. This gives Hagel an additional Anti-Bush position that is unique among Republican candidates. Depending on the status of our military participation in Iraqi sectarian violence at the time of the election, it may yet prove to be the only position that matters, and that will make Hagel the only electable Republican in the field. "The Republican Party has been heading in the wrong direction for a long time. Toward big government and away from small government. Toward politics and away from principle. Toward the South and away from the West. Toward moralism and away from morality. It's not to late to turn back, but time is running out." Chuck Hagel could still be the man to turn the Republican party back to its intellectual foundation and principles, before it is too late. FORMATTING NOTE: As noted earlier this post is being sent via SailMail, so will likely contain some odd formatting. I will edit, clean-up and add pictures and links on this post upon my return.